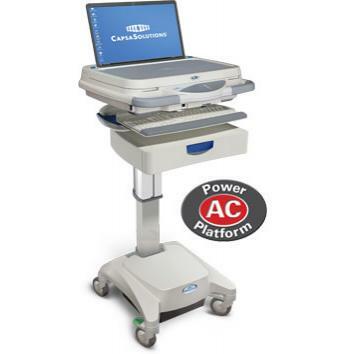 The LX20 Laptop Hospital Mobile Computing Cart line offers a lightweight design and AC power module that promotes extended cord-free run times. The LX20 Laptop Cart line is built upon a foundation that promotes dependability, reliability, and most of all – – confidence that your choice in this platform will ensure your computer cart program’s success. Fully-powered AC platform accommodates the most popular widescreen laptop models from Dell, HP, Panasonic, Samsung, Lenovo and others. The Capsa LX20 laptop hospital/healthcare computer cart is capable of accommodating widescreen laptops featuring 17” LCD (or smaller). The clamshell design encases the laptop for extra security. Combined with our secure storage solutions, Capsa’s Mobile Computing Carts offer the best of IT healthcare hardware and software solutions for Doctors, Nurses, Hospitals and Point-Of-Care healthcare providers. Streamlined nurse workflow is assured with a full complement of convenient accessories for medical laptops, organising supplies and the data management process at the point-of-care. mounted on back, sides, or front to provide convenient storage space. drawers provide secure storage of medications and supplies. when working in low-light situations. fully supports your infection control programs with ease. Capsa PowerWatch™ Monitoring Software gives the facility IT and clinical teams a real-time and ever-present view into the power system health of their mobile computing carts, no matter what type of battery system you choose. Keeping the computer cart drawer contents safe and organised is key to improving safety and workflow in any healthcare clinical environment. Choice of standard Key or Keyless access keyless system features drawers that relock upon closing to improve security multiple user access codes with different access rights based on job function and authorisation override code to permit pharmacy restockingLED battery status indicator can be used in conjunction with PowerWatch on-screen displayEasy-to-edit settings and simple user functionality ideal for Hospital, Nursing Home or Assisted Living environments where drug and narcotic security is a priority. The 4-tier configurable storage area on the LX20 is defined by you. Simply design the drawer set-up that meets your storage requirements, and if the need arises, you can reconfigure the set-up quickly and easily. The LX20 Laptop Cart offers you a choice of 3″, 6″ or 9″ storage drawers with either individual cam lock or keyless security systems. Depending on the hardware set-up, you can configure up to 12″ of vertical drawer space as you see fit. The secure vented laptop storage tray can be located in any of the tier positions on a column. Consult with your Capsa representative to custom-design the optimal storage of your LX20 Laptop Cart. Drawer Organisation Trays The LX20 Workstation offers you a choice of modular divider systems to provide secure segregated storage for medications, narcotics and supplies in hospitals & healthcare facilities. Choose from the removable 3″ Drawer Tray available in 3-slot or 6-slot designs, or the individual VersaBin™ trays that offer sub-divided storage and lids. The LX20 Laptop Cart can be configured and optimised for optimal functionality for Hospitals, Long-Term Care Facilities / Nursing Homes and bedside computer cart needs.